My Lace Wedding Invitation design created for a lovely couple ‘Elizabeth & Matthew’ who are getting married at The Kings Arms Hotel, Christchurch this September. Colour theme of Soft pink and silver with an intricate lace detail works beautifully on this gorgeous pearlescent white appliqué textured card… embellished with silver crystals and a Elegant Monogram of their names printed on the front of the Lace Wedding Invitation. Inside the pocket fold Lace Wedding Invitation you will find the Main Invitation, with RSVP card and Information card inside the pocket fold, enclosed with Envelopes. 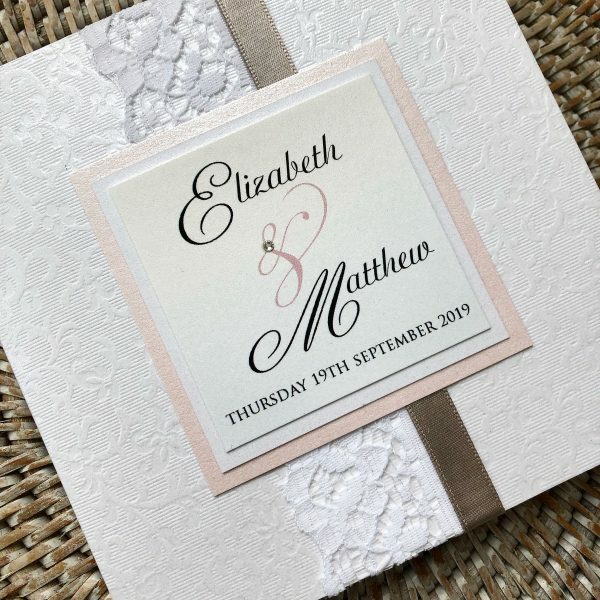 My couple have also placed an order for matching wedding guest place cards and table plan to match the colour theme and style of their Lace Wedding Invitations, created in white, soft pink and silver. Please email for details on design and pricing or for a free sample.